The Samsung 850 Pro SSD was installed in one of the right side 2.5 inch bays located behind the motherboard using a plastic drive carrier. The carrier has a springy latch that you press on to make room for the SSD to slide in to the carrier. It turns out that it does not need to be pressed very much. I snapped the first one off straight away. So, I grabbed another one and it fit perfectly. 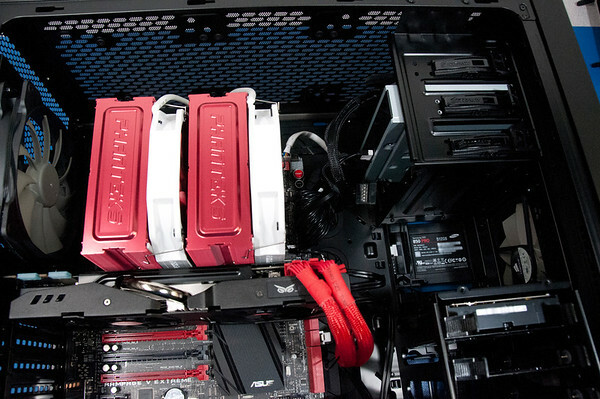 The carrier clad SSD then just clips into three mounting points in the case. I then routed a power cable with an SATA power connector to the drive through the right side compartment (rear of the motherboard, and plug it into place on the mounted SSD. The polarization of the connector takes a bit of fiddling with to get oriented correctly as the connector looks almost symmetric at first glance. All the power cables were held in place using the Velcro ties provided with the case. The SATA data cable was routed behind the drive bay stack to the SSD drive. 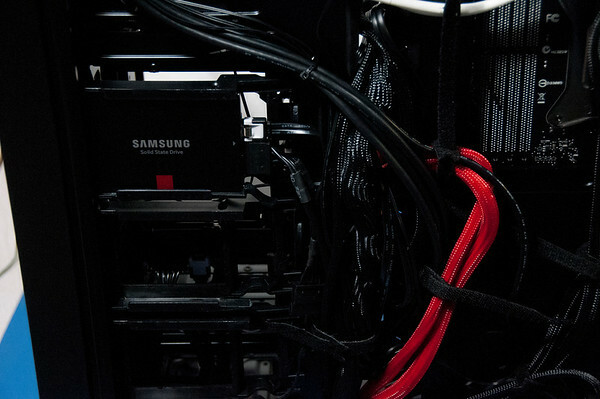 Figure 1 shows the 512 GB Samsung 850 PRO SSD installed in one of the rear 2.5 bays in the 750D case. The WD RE drive was clipped into a tool free hard disk drive carrier and slide into the top 3.5 inch bay. A power cable with a SATA power connector was routed through the right side compartment behind the motherboard and connected to the WD RE drive. The SATA data cable was routed to the drive by snaking the data cable behind the 3.5 inch bay stack. Figure 2 shows the 512 GB Samsung 850 PRO SSD installed in one of the rear 2.5 bays in the 750D case viewed from the front of the case. The WD RE drive is also visible. Figure 3 shows the installation video of the Samsung 850 PRO SSD and WD RE hard disk drive.